The world of music documentaries is full of studies of musicians, bands and the like, but little attention is paid to one of the most important sides of the music business - the visual side. Stop the average person in the street, in any country, and most will recognise the Floyd's iconic Dark Side of the Moon prism, one of the biggest selling t-shirts of all time. Play them some of the music though and they might struggle to name the band, or the album. For most people, album covers are an essential part of the tapestry of their musical world and journey. The images can conjure up all manner of thoughts and memories (good and bad) and the covers themselves have arguably convinced most of us to buy an album to check it out (with varying degrees of success). One key team behind a significant amount of most people's record collection covers are Hipgnosis. Taken By Storm - The Art of Storm Thorgerson and Hipgnosis is a fascinating, amusing, touching and thought-provoking documentary looking at the design team's history and methodology. As we know, Storm was always determined to go his own way (much to the exasperation at times of record company staff) and do everything as much as humanly possible entirely for real, rather than cobble things together in a computer. Very ably directed by Roddy Bogawa, the documentary features interview segments throughout, with the likes of Nick Mason, David Gilmour, Peter Gabriel, Robert Plant, Steve Miller, 10cc's Graham Gouldman, Alan Parsons, and many more, giving their memories and anecdotes of working with Storm over the years. These are blended with archive footage of Storm and Po from their earlier days, and more recent footage of both either discussing their work, or actually creating it. There's plenty of great material, including some good Floyd stuff - such as a flight over the beds on the beach whilst in the middle of the Momentary Lapse cover shoot. The hour and a half of the main feature really flies by, with your attention firmly held to the screen. For those who never had the pleasure of knowing Storm, it gives an insight into his wit, his determination, and his working methods. For those who did know Storm, it is a wonderful reminder of just what a unique man he was. Above all, it reminds us all of what a massive contribution he made to modern, popular culture. This is a documentary that deserves to be seen, a thoroughly enjoyable gambol through Storm's life, giving detail on how he knew various members of Pink Floyd before they made it big, and how Hipgnosis came to start designing their album covers from A Saucerful Of Secrets onwards. Hipgnosis were so much more than just a Pink Floyd concern, and their work for artists of all sorts is covered well. Storm's short-lived toe-dipping in the world of music video and film direction is also covered in a fascinating sequence which will no doubt prompt people (such as me) to go off to YouTube to check out his work on there. The extras included on the DVD are a real mixed bag, all of which are interesting in their own way. The meat of the extras is in the first part, where you have Robert Plant discussing the In Through The Out Door cover, including the water-activated inner sleeve, and the paper bag outer. Peter Gabriel talks about his covers, and in particular the first album, also known as "Car". Biffy Clyro discuss the artwork that Storm did for them - and the attitude of Storm in record company meetings! As befitting a documentary about Storm, the packaging has been designed by StormStudios, and a lovely job has been done. 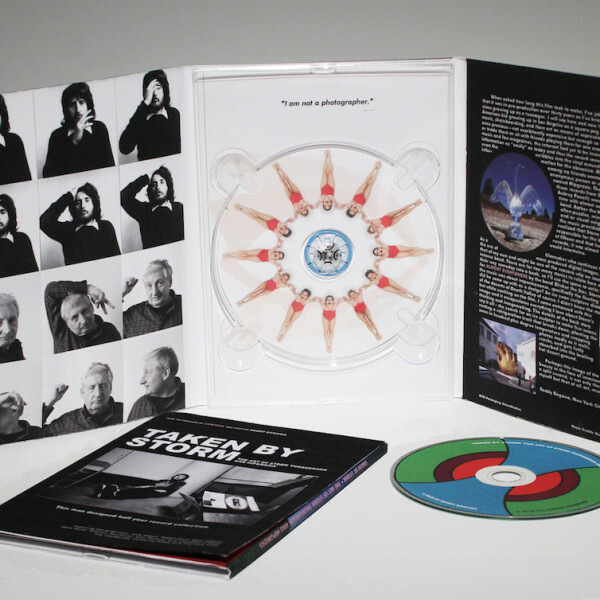 The digipack is akin to a double gatefold album, the disc itself sits within a central holder, book-ended by a sequence of twelve shots of Storm - six from the 1970s, and six from his final years, with Storm clearly in a playful mood posing for the camera. This, of course, was something he was never keen on for his subjects/clients, and it makes for a fun montage. The other 'page' of inner cover has an interesting piece by Bogawa, talking of the background to the project, and also giving a precis of the design philosophy employed by Storm and his gang. Some fun quotes are distributed around the cover too, including Monty Python animator Terry Gilliam. As noted boldly on the cover - 'This man designed half your record collection' - the film is an essential look at the process behind something many people don't really think about. The creation of any image, be it for a book, record, or box of cornflakes, is a complicated one and the creation of truly great images, which one feels passionately about (even just subconsciously), should prove absorbing and enlightening to the audience. Bogawa has done a wonderful job, not just celebrating Storm the man, but celebrating the tireless work he undertook, designing and delivering images, in a well-paced, informative and fun documentary that deserves to be seen by music fans of all styles, as well as those interested by design in general. You can order the DVD, as well as a print and movie poster, or stream it online (soon) from the official site - TakenByStormFilm.com. There's also a book - If Films Could Smell - by Bogawa available to preorder soon.